I hate messing with the lock on my door, mostly because I have only a deadbolt. This of course means that every time I walk out my door I must turn around and lock the door with my key. Wintertime is the worst, as I must fumble for my keys every time I go in or out of my house. There are days that I wish I could just use something simple like a biometric lock like this one. 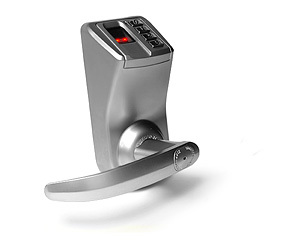 This door lock works like most devices with a biometric scanner. You’ll program all of the fingerprints (up to 120) directly from the keypad, eliminating the need for a PC. The handle can be positioned on either the left or right to accommodate most doors and will lock automatically. The one thing that worries me is that it runs off of four AA batteries. What happens when the batteries die? If you’re paranoid about security, tired of locking your keys in the house or just want to have the coolest lock on the street, you can pick up this one for $199. The lock can be bypassed with a 9volt on the outside in case the batteries run out. So basically anyone can get in with a 9v? Does anyone in South Africa sell these locks?